Along with the current glut of courgettes here in the UK, there seems to be a corresponding glut of courgette cake recipes. Guess what? I’m not bucking the trend. It took a while for our courgettes to get going this year, but they are now coming thick and fast. It’s courgettes for every meal at the moment so using them in a cake is merciful relief. I have made three courgette and chocolate cakes so far and none of them come from the three recipes I have in my cookery books. So, I thought I really ought to start ticking those off. This time I have gone with the one from the Riverford Farm Cook Book. Theirs is a large one and cooked as a tray bake to feed the hungry hordes. We were off to visit friends who were down holidaying in West Cornwall, so something was needed that would a) travel well and b) feed a crowd – admittedly a small crowd, but teenage boys are not renowned for their small appetites. Grated 450g courgettes (a single fairly large one). Creamed 120g unsalted butter with 200g muscovado sugar until well incorporated and most of the sugar lumps had disappeared. Beat in 125ml sunflower oil. Beat in 3 eggs (2 duck and 1 hen) and carried on beating until the mixture weirdly resembled mayonnaise – in consistency if not in colour. Beat in 100ml milk and 1 tsp vanilla extract. Sieved in 350g flour (175g white, 150g wholemeal, 25g hemp), 2 level tsp baking powder, 1/4 tsp bicarb of soda and 4 level tbsp cocoa. Stirred carefully until all incorporated. Drained off the majority of courgette juice that had formed and stirred the gratings into the cake mixture. Scattered 1 level tbsp of cardamom sugar over the top. Scraped into a 9″ sq cake mould and baked at 180C for 40 minutes until risen and firm. Cooled in the mould then cut into 16 squares. The sugar gave the crunchy top I was hoping for and the cake was moist, tasty and not too sweet. The recipe had advised peeling the courgettes, but I’ve never done that before and couldn’t see the need. As I’d hoped, there was virtually no sign of the courgette. It was only on re-reading the recipe later that I realised I was meant to put an additional 100g of sugar in – no wonder it wasn’t too sweet!!! They were most welcome after an energetic walk along the coast, which despite the thronging crowds in Porthleven was virtually deserted. Wow courgette in cake that sounds very innovative . I love the three eggs 2 duck and 1 hen! I bet these didn’t last long with all those teenagers about! Have a great time in Cornwall and that cake should keep the hungry hordes as bay! It looks delicious. I made my We Should Cocoa entry yesterday, I will post it this week as soon as I liberate the photos from my camera! does it taste courgettey or chocolatey? ? am scared to try but I guess beetroot works in brownies so why not courgette!! Beautiful! I’ve always wanted to visited Cornwall. and these look delicious.. I am a recent convert to courgettes and chocolate. Simply Food – an adventure worth trying! A Trifle Rushed – ha ha, I ran out of duck eggs! I suspect the teenagers would have enjoyed it more if I’d put in the full amount of sugar. Karen – thank you. We do live in Cornwall, but not in the holiday area down West, which is lovely. Looking forward to seeing your WSC entry. Spontaneous Euphoria – I’m very lucky to live in Cornwall and you’re right, it’s a good combination. Courgette glut? You’re lucky! Half our plants haven’t grown, and the fruit on the remining plants are rotting before they reach a reasonable size! Your cake looks very good! Yum! I made courgette cake once and it was delicious. Im not surprised yours went down well. The view look good albeit overcast! Saw a guy making a courgette choc cake on Great British Bake off. Your cakies look fab. Love how you used hemp flour in these! I love baking with hemp flour, and I can imagine it would be so lovely and nourishing with the courgette in this wonderful cake – looking forward to fixing the recipe! I have been craving brownies for the last two weeks and have a courgette sitting in the fridge to go in a chocolate & courgette cake. How gorgeous. In the past I’ve used up the glut by making ribbons with a peeler and using them as mock noodles in Asian soups – but I have a feeling the husband will like them better in a chocolate cake. I love health food when it comes in cake form!!!!! chocolate cake and the cornish coast sounds idyllic to me – I’ve never peeled my courgettes either – seems a waste of good greenery! mmm crunchy sugar topping; how nice does that sound?! Those photos are really nice; hope you had a ball! Also, I love Riverford Farm; I made their root veg soup for my starter on the wee “Come Dine With Me” competition I had with my friends and it went down a treat! wow chele, all those photos, especially the last one makes me feel so thirsty and hungry. when i read the ingredients, i must say i am very keen to try this put and tuck in. Looks gorgeous and moist. I’ve just made my first chocolate courgette cake and wonder why I waited so long! I’ll have to investigate other recipes now! Suelle – yes, ours haven’t done nearly as well as last year and lots of them are rotting as they grow too – lack of pollination we think. They are just about coming to an end now, usually we get them until the end of September. Lucie – thank you, yes the courgette keeps the cake nice and moist. Baking Addict – not the best photos of Porthleven ever, but hopefully gives an idea. Janice – I caught up with GBBO on iPlayer and he peeled his courgette – seemed like a monumental waste of effort! Astra Libris – I used to use hemp flour a lot and then stopped for some reason. Luckily managed to find a supply again. As for the friendship starter, it’s sitting in the freezer at the moment. There’s just never enough time to play! I do make my own rye sourdough though, so I added a bit of that to the 1st cake I made. Jac – and have you made one? 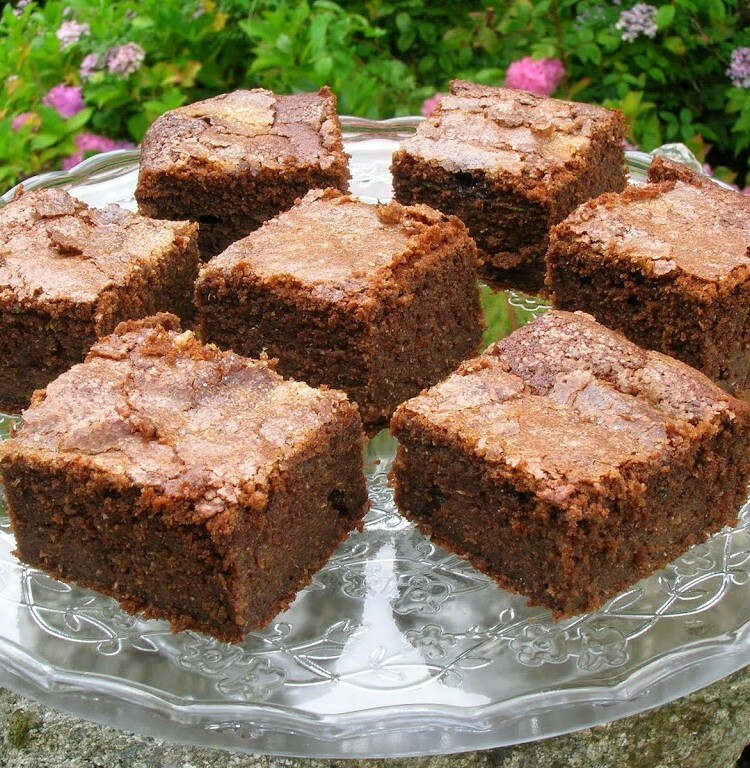 Katie – they were really good, but not nearly sweet enough to be a brownie. Kate – that one is on my list, I’ve also got the G&B one to try at some point. Who’d have thought there were so many chocolate and courgette cakes! Nic – thank you, that was very kind of you. Johanna – ha ha, yes a good combination – shame it was rather grey. Peeling courgettes seems like a waste of time, but each to their own I guess. Catherine – ah thank you. Having your own Come Dine With Me must have been fun. Cooking Varieties – baking with vegetables is quite fun, especially when no-one can guess what’s in the cake. C – your cake looked delicious. This is so interesting and unique recipe to use hen and duck egg! Sound lush! Thanks Eileen. I always bake with duck eggs when and if I can get them.